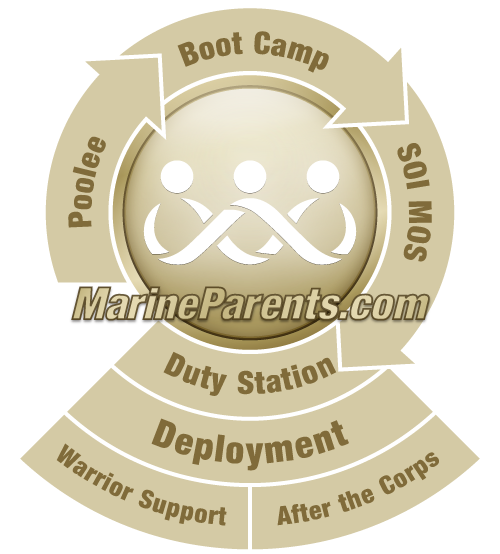 The following are links to OFFICIAL Marine Corps web sites as well as Marine Corps services, foundations, organizations, and associations that are endorsed or recognized by the USMC. As I build this page of the web site, and read about all of these organizations, I am truly humbled by the greatness of the United States Marine Corps. I am honored to be a small part of this elite and outstanding organization. Tracy Della Vecchia ~ Founder, MarineParents.com, Inc. The top six Marine Corps web sites are listed first. The remaining are alphabetical by title without taking USMC or Marine Corps into consideration. For all who have earned and worn the eagle, globe, and anchor, the Marine Corps Association is the professional organization for all Marines-active duty, Reserve, retired, and Marine veterans. The MCA understands and identifies with the sacrifices made and the services rendered as a Marine to this great country. Once a Marine, always a Marine! Founded in 1798 by an Act of Congress, "The President's Own" United States Marine Band is America's oldest professional musical organization. Today, "The President's Own" is celebrated for its role at the White House and its dynamic public performances. "The President's Own" encompasses the United States Marine Band, Marine Chamber Orchestra, and Marine Chamber Ensembles, and performs regularly at the White House and for more than 500 public performances across the nation each year. For information about parades at Marine Barracks Washington, please visit the General Information, Evening Parade and Sunset Parade web pages. Train and educate newly commissioned or appointed officers in the high standards of professional knowledge, esprit-de-corps, and leadership required to prepare them for duty as company grade officers in the operating forces, with particular emphasis on the duties, responsibilities and warfighting skills required of a rifle platoon commander. The Official MCRD San Diego website. The CCE provides a variety of Distance Education and Training opportunities for all Marines. Our online learning management system, MarineNet, provides both military and civilian education to all Marines wherever they are stationed, while our worldwide seminar program supports the Officer Professional Military Education (PME) Distance Education Programs (DEP). Through a network of satellite campuses, learning resource centers, and video teletraining (VTT), the CCE brings an effective structured system of professional military education and training opportunities that are central to all Marines. Concepts and Programs articulates the modernization requirements of the United States Marine Corps, and presents an overview of current plans to give our Marines in pursuit of America"s national security the best warfighting tools available. The Foundation preserves and shares the history and traditions of the United States Marine Corps in order to educate and inspire current and future generations of Americans about our Corps' legacy of sacrifice and contribution. Established in 1946 as a Living Memorial to the Marines who lost their lives in the Pacific during World War II, the non-profit Marines' Memorial Association offers Membership to former and retired members of all branches of the U.S. Armed Forces. The building's history dates back to 1926 and the decor still retains the character and elegance of old San Francisco. A Monument to Honor, Courage and Commitment... Currently under construction and scheduled to open in November 2006, the National Museum of the Marine Corps will be a lasting tribute to U.S. Marines -- past, present and future. Situated on a 135-acre site adjacent to the Marine Corps base in Quantico, Virginia, the museum's soaring design evokes the image of the flag raisers of Iwo Jima and beckons visitors to its 100,000 square foot structure. World-class, interactive exhibits using the most innovative technology will surround visitors with irreplaceable artifacts and immerse them in the sights and sounds of Marines in action. An IRS recognized 501(c)(3) public charity providing support and information to parents, spouses, family and friends of our Marines. The Single Marine Program (SMP) was established to provide a forum for Marines to identify quality of life ideas and issues and recommend solutions. Marine Corps University's mission is to develop, deliver, and evaluate professional military education and training through resident and distance education programs in order to prepare leaders to meet the challenges of operational environments. The Marine Corps University was established in 1989 to serve as the focal point for the Marine Corps' professional military education programs. It provides the structure and policy for the Corps' worldwide professional military education network, integrating both resident and nonresident programs for all Marines, active and reserve. The WMA is a non-profit veterans association comprised of women who have served or are serving honorably in the United States Marine Corps regular or reserve components. Since 1918, American women have answered their country's call to serve. We have served proudly with distinction and honor; each generation evolving but always retaining our proud traditions.